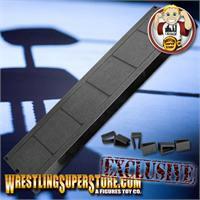 Extra Straight Ring Barricade Piece. This is one straight piece of a ring barricade that you can connect to your existing ring barricade to make it longer. Only works with the one on our site (in the related products below). Includes 6 clips that attach the extra piece to your existing set.